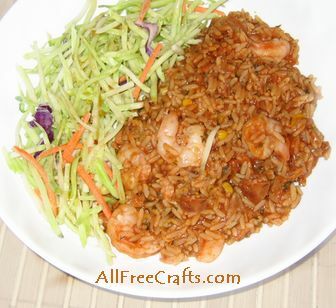 Jambalaya makes an interesting rice dish and a satisfying mid-week meal, flavored with savory spices and the addition of ham, sausage, chicken or shrimp. I’ve found that jambalaya recipes aren’t really suited to layering, but the colorful spices still look good if you make this recipe either as a jar mix or a gift in a bag. Do a search for Jambalaya Gift in a Jar and you’ll find one recipe that seems to have made the rounds on most popular cooking sites. I began with this Jambalaya Mix recipe, which originated in Southern Living in 1998. I added in the celery seed, upped the bouillon, but used the least amount of red pepper to best suit my husband’s rather bland English taste buds. But my daughter, who likes things very hot and spicy, took a taste-test then added a dusting of cayenne pepper to her own plate. As with many jar mix recipes, it’s a good idea to make a batch for yourself first, then tweak to taste. I think that the recipe that follows, however, is a good basic jar mix for jambalaya. r sausage, (plus diced green pepper and celery, if using), then simmer for about 20 minutes or until rice is tender. Add shrimp, if desired, and simmer for 5 more minutes. Discard bay leaf and serve. The dry mix makes about 1-1/2 cups, which fits nicely into a snack-sized zip bag of 6-1/2″ x 3-1/2″. You could also pack the mix into a jar, although I found it hard to find a jar to fit. You may print this small Jambalaya label if you like, and you should also write out the cooking instructions to include with your homemade gift. I have also created a larger Jambalaya Recipe Mix Instructions Gift Label, which you can print and cut out, then fold in half, and in half again, so that the picture is on the front and the recipe instructions are inside. Punch a small hole in the top left of this little leaflet, then tie to your jar or gift bag. Gonzales, Louisiana is known as the Jambalaya Capital of the World, hosting a Jambalaya Festival every year. A notable part of the festival is a cooking contest where participants cook their jambalaya outdoors in black pots over open wood fires. Preliminary rounds consist of jambalaya made with 30 lbs of chicken and 10 lbs of rice, along with yellow onions, garlic, green onions, red pepper, red hot sauce, bell peppers, celery, salt, black pepper and cooking oil. No other seasonings are allowed.